Today’s food holiday would make even a Jack-o-lantern smile: October 21 is National Pumpkin Cheesecake Day! It’s also International Day of the Nacho, but there’s a National Nacho Day coming up in a little over two weeks, so we’ll be honoring cheese-covered tortilla chips then. And some calendars list today as National Caramel Apple Day, but the majority say that one’s celebrated on Halloween, which seems pretty fitting to me. Today, it’s all about sinfully creamy and delicious pumpkin cheesecake. Pumpkin cheesecake is a seasonal treat that takes the best of two desserts – pumpkin pie and cheesecake – and combines them into one heavenly treat. I’ve written about the history of cheesecake in previous posts, so follow the preceding link if you need to get caught up to speed. (The fact that stands out most to me: cheesecake was served to athletes during the first Olympics ceremony in ancient Greece. Interesting concept of “health food,” huh?). 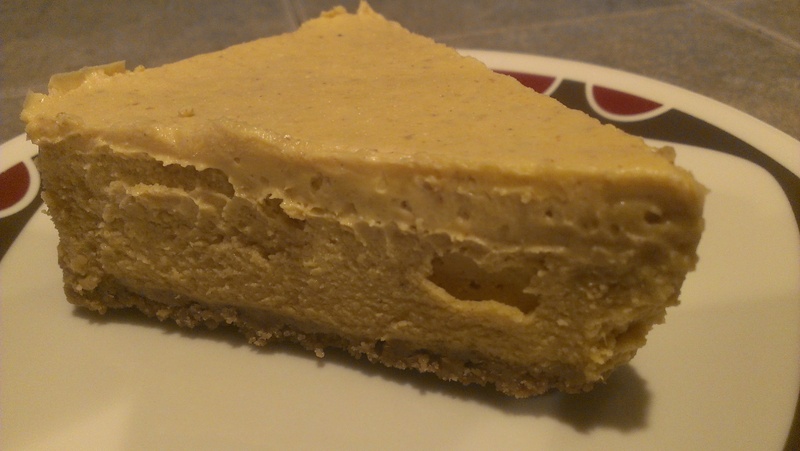 It’s unknown when the first pumpkin cheesecake was created, or who invented it, but I remember trying it for the first time about six years ago. Nowadays, it’s an autumn favorite at places like The Olive Garden. Neither of us had ever made a cheesecake before, and neither of us wanted to make a whole cheesecake, you know? That’s a lot of high-calorie leftovers. Luckily, we were able to find individual slices at New Seasons Market. I have to give a shout-out to this local grocery chain that specializes in fresh, locally grown, organic, and specialty foods. They’ve been a lifesaver for a number of challenges (bagels and lox, cherry cheesecake, etc.) and often have hard-to-find food items we can’t get anywhere else. Once again, they came through for us! We shared a slice of pumpkin gingersnap cheesecake that was like the most decadent pumpkin pie ever…and then some! Looks divine!! Probably a bit cheaper than OG too. Although, the Pumpkin Cheesecake there is pretty darn tasty and a bit bigger too. This slice was $3.99, I believe. Not bad! And a heck of a lot less work than if we’d tried to make one ourselves.